NEC's MultiSync 90GX2 bears a strong family resemblance to the successful LCD1970GX. Like that model, the 90GX2 employs a nice-looking glossy screen and the clever NaViKey screen control button. 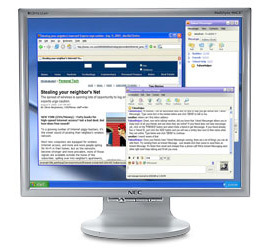 Glossy-screen monitors have a reputation for showing clear detail and vibrant color. On PC World's text tests, the 90GX2's OptiClear screen did particularly well with the challenges of reverse type and gray text in our multi-sized font and Microsoft Word test screens. Our jurors gave it very high marks for graphics, too, especially with the fine detail and color nuances of our photo test screens of a group portrait and a fruit tart. That said, one juror found the screen reflection distracting; it's a good idea to make sure you like glossy screens before you buy a monitor that uses one. The 90GX2 improves on its predecessor's looks and maintains the same useful design elements. The silvery bezel dresses up a dull gray cabinet, and the more rounded lines of the 90GX2 make a welcome change from the hard edges of the LCD1970GX. More important, digital photographers and other USB-hungry users will like having two USB 2.0 ports on the left side of the bezel and another two stowed in the back of the cabinet. The 90GX2 comes with NaViKey, an eraserhead-like button that's much more comfortable than buttons for scrolling up and down the colorful screen-adjustment menus. NEC doesn't include its NaViSet screen adjustment software on CD, but does offer it for download from a Web site. The 90GX2 claims a 4-millisecond response time. In theory, screens with lower response times deliver smoother movement with less motion artifacting. However, our real-world motion tests detected no discernible difference in motion quality between the 90GX2 and products with an 8ms or even 12ms response time. Upshot: The glossy-screened NEC 90GX2 shows crisp text, and its eraserhead-like NaViKey makes scrolling through screen menus a breeze.